Do your upper arms have excess loose skin and fat causing an unattractive appearance? Do you miss wearing short sleeves or sleeveless dresses or tops? Daniel Man, M.D., a Florida board-certified plastic surgeon, uses arm rejuvenation techniques to restore a youthful appearance to the arms of people living in and around Boca Raton, FL, and the surrounding communities without the need for plastic surgery. Over the past 20 years, the approach to arm rejuvenation has been improved with a combination of tumescent (fluid) injection, ultrasound, and suction lipectomy, but in Dr. Man’s office, a more effective, combination procedure is used. With suction lipectomy (if required) and an arm lift (brachioplasty), Dr. Man creates well-rounded, defined upper arms that women desire. Combination arm rejuvenation therapy is designed to give you toned, taut upper arms. Dr. Man can consult with you to decide what procedure(s) will work best for you. How Involved is Dr. Man’s Special Arm Rejuvenation Procedure? Using combination therapy provides the best results, as it harnesses the ability of the skin to contract. Dr. Man supplements with a special protocol where he removes more fat and tightens the skin on the arms. The laser and RF treatments provide substantial improvement enhancers. Excellent results can be obtained in patients who have very good skin tone that contracts after suction “lipectomy”. The ART Bed (articulating, reclining, tilting bed), allows Dr. Man to judge the degree of progress and improvements, unlike conventional operating room tables that cannot supply the surgeon with this unique information. If skin is too loose and extensive, brachioplasty can be employed to remove redundant skin and excess of underlying fat from the bottom of the upper arm. The repair of soft tissue laxity and excess of fat allows for a good repair at the surgical site, so the incision will normally be small, and after it has faded will be hidden on the underside of the arm in the natural contour. This combination procedure is done under IV sedation and takes about two hours to complete. If excision of excess fat and skin is required, the procedure may take slightly longer. After the procedure, the arms are covered with special foam dressings along with compression garments if necessary. Small drains are placed in the incisions to collect fluid to prevent an infection. After the procedure, patients are taken to a recovery room to rest until the anesthesia wears off. At that point, patients may leave with a caregiver who plans to stay with them for at least 24 hours. If there are small children at home, caregivers are asked to help as much as possible to prevent the patients from overdoing it or ripping stitches. Full recovery from arm rejuvenation takes several weeks for most patients. Although the full results aren’t truly visible for a few months, some positive changes are immediately noticeable. The stitches, if any, may be absorbable or may require removal in less than two weeks after undergoing the procedure. Most patients may return to semi-normal activities within a few days but will wear the arm dressings for several weeks under their clothes as additional skin tightening takes place beneath these special dressings. Physical exercise is restricted in the upper body and arms for a similar period. It is recommended that patients take a week to 10 days off work, especially if extensive surgical options were employed; however, this may be flexible depending on the type of work involved. How Much Does Arm Rejuvenation Cost? The cost of arm rejuvenation varies with each patient and is based on the extent of the work to be done, along with if other procedures are performed at the same time. During a consultation, we can discuss the cost as well as our payment options, including financing. We accept cash, personal checks, and credit cards as payment for all procedures. 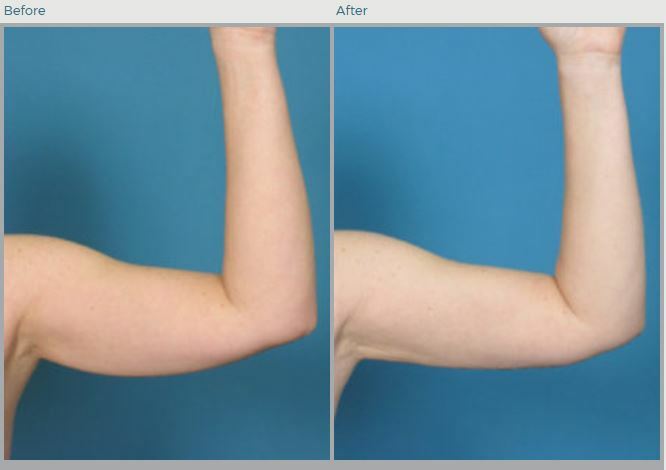 If you are considering arm rejuvenation, we recommend you schedule a consultation with Dr. Man to discuss your options. During this appointment, Dr. Man takes the opportunity to get to know you and your goals, evaluate your upper arms, and discuss possible treatment options to achieve your desired look. Once he recommends a procedure, he goes over the details of the procedure and answers any questions you may have about it or anything else. Do you feel like you have excess flab on your arms when you wave at people even though you have experienced a significant weight loss? Daniel Man, M.D., a Florida board-certified plastic surgeon, performs arm lift procedures on individuals living in and around Boca Raton, FL, and the surrounding communities. Please contact us to set up your consultation today.